Core Products Water Pillow 294 :: Pain Management :: Core Products Int., Inc.
New Design! The new oval-shaped embossed center provides comfortable cervical support. New Materials! Sateen Cotton Cover feels cool and gentle against the skin. 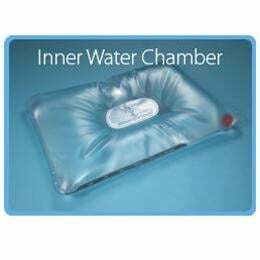 The water pillow’s chamber is removable for mess-free filling. The handy support guide makes it easy to choose the correct water level for the firmness desired.